Yes, that’s right. I’m geeking out about gardening. What is it about gardening that makes me love it so? Digging in the dirt with a shovel, hoe, trowel or your hands feels so good. Somewhere along the way we westerners have lost what it is to plant and grow your own food. The visceral experience of getting dirt under your finger nails (or toe nails, if like me you sometimes go barefoot) is something everyone should have and more than once. Planning what you will grow, how and where is so satisfying both during the construction of your garden and after when you can feel accomplished. For those of you who know what a true zen moment is, gardening has the potential to connect you to nature in such a way that is like no other. You naturally breathe deeply, you relax, you notice birds, butterflies and the wind like you may never have before. If you haven’t experienced a zen moment before, I recommend gardening as your gateway. I have participated in growing food and flowers since I was a small child. My parents had a huge garden where we grew beans, peas, asparagus, rhubarb, corn, and more. One year my parents let me try to grow watermelon, but sadly, it didn’t grow. I grew up in southern Wisconsin, and maybe it was too cold at night or maybe there wasn’t enough rain? Or too much? I’m not sure. I have learned that growing melons and squash (pumpkins especially) is a tricky business. I decided that this year I would try to do it right and plot out my plants, start as many from seeds as possible and only use rain water. I started my seeds in March, using a starter kit which had 64 pods with soil and fertilizer in them. You put a few seeds in each pod and then water. I planted many different items including herbs, tomatoes, zucchini, pumpkins, spinach, lettuce, beets, peas, beans, broccoli and onions. Most of the herbs didn’t grow, except sage. I have so much sage now, I have been giving it away! The spinach didn’t work and neither did the beets or broccoli. I don’t know if I watered them too much or not enough or if the seeds were just not good. Either way, I chose to buy broccoli and herbs from Lowe’s. I didn’t have a lot of money to spend, so I got some items from friends, which I recycled. 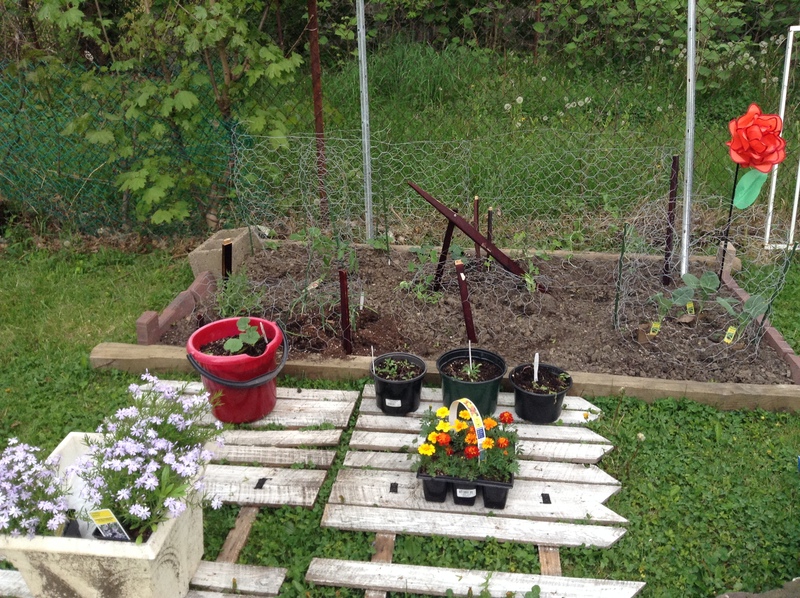 I used old fencing, logs, bricks, cinder blocks, a broken chair, pieces from a broken bed frame, wire I used last year and I bought a few bricks and of course dirt. In this picture you can see the posts I dug out from a previous tenant’s attempt at gardening next to the back deck. I moved them to form 2 sides of my first plot. I used cinder blocks and bricks I had bought to form the other 2 shorter sides. I used plastic, wood and metal items for stakes to hold the fencing in place. I put fencing up because we have neighborhood cats that like to dig, not to mention squirrels, birds and the occasional rabbit. You can also see the old fencing. In this picture I hadn’t decided what to do with it yet. 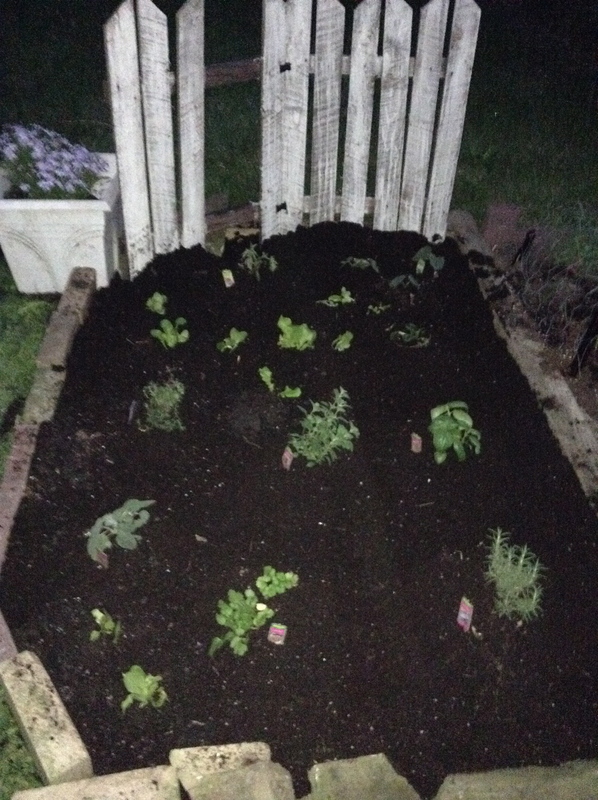 Here is the 2nd plot with herbs and lettuce. I used a piece of fencing at the short end. This will eventually be used for beans to climb. Also, you can see that I used a planter, also from a friend with some larger flowers as part of the “wall” that holds in the dirt. You can see how I lined the 2nd one up in front of the 1st. It’s also about 2/3 of the size. I thought long and hard about what to do regarding soil. The soil in my yard is not fit for growing much but weeds, so I went with a mix of top soil and potting soil. About 3 top soils to 1 potting soil. I used a hoe to mix them together. I also experimented with different ground cover. 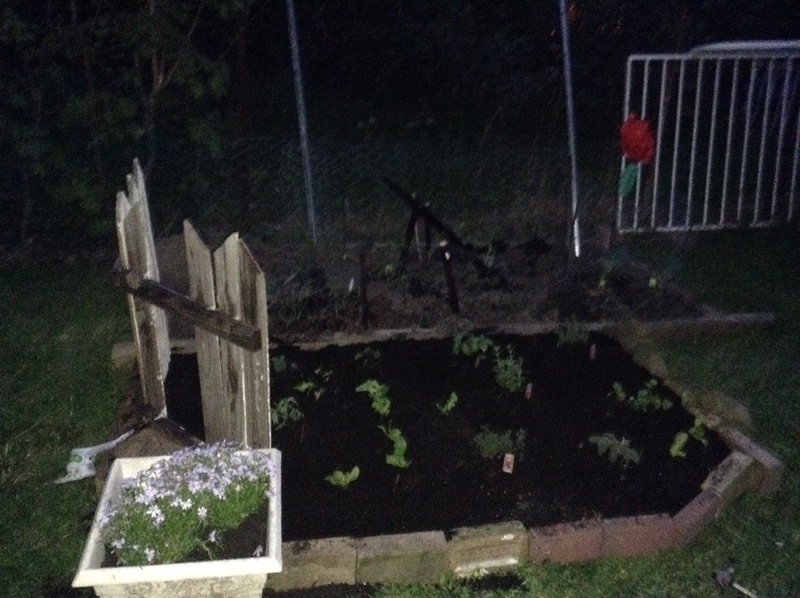 I used lava rocks in one, cardboard in the 2nd and black garden sheeting designed to keep weeds out in the 3rd. All of them are doing a fine job so far of keeping out the weeds. The only ones that keeps poking up are the ivy that are so tenacious, they would grow anywhere. The ivy is generally not growing up through the garden plots, but up from the grass surrounding it. I keep pulling it up by the roots and finding new ones each time. Oh well, it keeps me alert. I’m going to end this post here. I will post another soon with an update on the garden. I have been getting lettuce like crazy the last few weeks! Who knew gardening is in the genes. Mine comes all the way from Slovakia!!! !